When I say I've been working on my Beekeeper's Quilt for almost three years, you should know that I haven't been consistently working on it during that time. It's something that has been the object of numerous obsessive phases when I couldn't stop myself making the constituent 'hexipuffs', and at other times several months have passed between thinking about it at all. So it's still very much a work in progress (WIP) and will, no doubt, remain one for some years to come. The truth is I have a couple of hundred 'puffs which would already be enough to make something - like a bench cover, which was a possibility at one point - but I like the fact that it's a slow project and that there really is no rush to finish. I haven't started joining it together yet for the simple reason that I love the possibilities that exist while it's still in bits. Maybe the colours will be random. Maybe I'll make it into a rainbow, or perhaps some kind of flower motif will appear from careful arrangement... I really don't know... but it's fun thinking about it. Can you imagine my panic? After further inspection it seems that these are the only two affected by the mysterious holes. There are no further signs of winged creatures, eggs, or mouse droppings and the bag was sealed. As these were at the bottom of the bag, I think they were some of the earliest 'puffs and so they have probably been in various places at different times. Maybe they got trapped in a zip...? Maybe they went on an unseen adventure with one of the kids...? 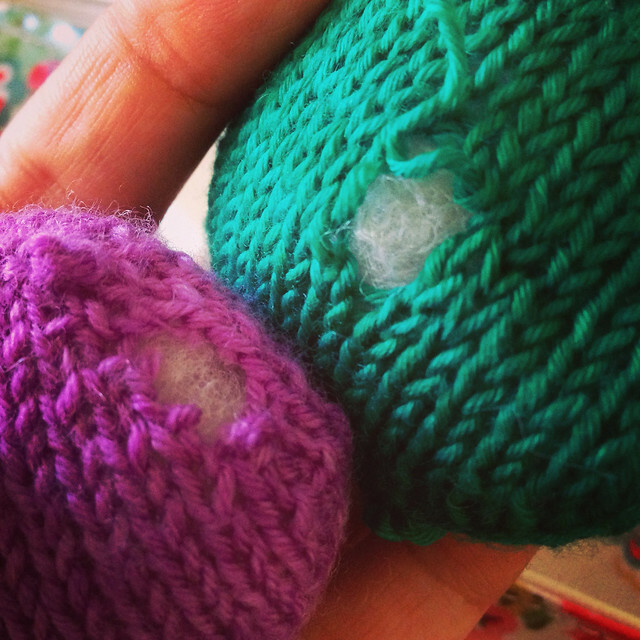 (There is still a missing set of hexipuffs that didn't turn up after LM was playing with them when she was a toddler!) I really don't know. To be safe, I'm sealing the lot up today and popping them in the big freezer we keep in the garage. If there are any moth eggs, I'm assured that will kill them off. I'm also ordering some more lavender bags to repel the horrid creatures from my stash. Any other tips for me? In other news, my Ravelry username has been changed to Sarah-Knight so it's easier for people to find/identify me. I think the old links to projects should all still work. Also the June fit-along is now in it's third day and off to a great start. There are more people joining in on the fitbit group later where, as of 9:50 am today we have a combined step total of over 111,000 since June 1st! There are more 'lurkers' than participants on the Ravelry group - please don't be shy, if you're thinking about joining in come and say hello! The pink looks like some dropped stitches maybe while the green kinda looks like a weird YO occurred. Definitely going to have to look through mine to make sure I don't have any mysterious holes!